HALKIDIKI, Greece, Apr 27 2013 (IPS) - Any sense of tranquility that hangs around the mountain of Skouries in northern Greece, 80 km east of Greece’s second largest city Thessaloniki, is a façade. Home to some of the oldest forests in Greece, the pristine region is now a battleground, as the local population takes on the Canadian mining giant Eldorado Gold Corporation and its local subsidiary, Hellas Gold. The guards have good reason to worry. A huge majority of this community of 40,000 opposes the extractive project, which aims to mine approximately 12 billion dollars worth of copper, gold, silver, zinc and lead that have been slumbering untouched under this mountain. This past February, hooded men wielding Molotov cocktails set fire to bulldozers, containers and other equipment to mark their resistance to so-called “cheap extraction” plans, approved by the Greek government in 2011. The corporation has pledged to invest 1.2 billion dollars into the creation of a huge open pit mine, as well as a network of smaller mines below the surface of the mountain. It says the project will generate over 1,000 jobs for locals and pump new life into Greece’s sputtering economy. On the morning of Feb. 17, about 40 hooded men entered Eldorado Gold’s main construction site, immobilised four security guards, and torched vehicles and offices belonging to the mining company. 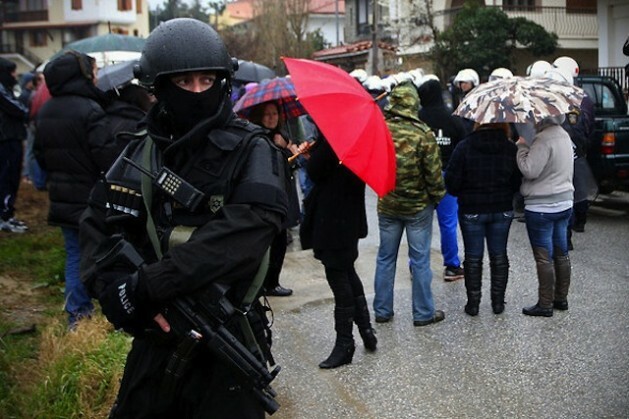 The next day, Minister of Order and Citizen Protection Nikolaos Dendias personally visited the scene and passed control of the site into the hands of the state’s notorious anti-terror squad. This paved the way for a period of investigation and interrogation that has cast a cloud of fear over residents of the mountain village of Ierissos. According to Vassilis Tzimourtos, a lawyer for many of the residents, the process of interrogation resembles “persecution and intimidation”, circumventing civilians’ rights by using “irregular proceedings in order to provide…fabricated evidence”. This process has involved the “abduction of citizens, forceful DNA extraction from suspects who afterwards were ordered to sign consent (statements), and the profiling of everyone who disagrees with the investment as a (potential) suspect," he said. “I was detained for hours without my family being informed where I was,” an 18-year-old resident named Theofilos Bantis told IPS. He says he was abused until he agreed to give his DNA sample. On the night of Apr. 10, police forcibly entered the homes of two villagers who had supposedly been “identified” as the perpetrators of the arson, and arrested them. The local interrogator has ordered that they remain imprisoned until their trial. Though the government has constantly rejected or ignored allegations of misconduct in this case, Amnesty International has called for an investigation into police actions. But residents say the mine will only rip into the mountain, destroying the environment and leaving Greeks with the bill for a massive clean-up operation. A close analysis of the contract shows Greece will not pocket even a significant portion of the mines’ projected revenue. Christo Pahtas, mayor of the municipality that houses the natural deposits, signed away extraction rights to a 317,000-square-kilometre area without specifying royalties for the state. Currently, Greece is only eligible to earn social security contributions for workers employed in the project, and taxes from the company’s profits — which could reduce dramatically if Eldorado opts to process minerals in another country. Arguments over the extent of possible environmental impacts have already split the scientific community here. The state-run Institute of Geology and Mineral Exploration has formally thrown its support behind the investment, even while academics cry foul on the company’s claims that “new” extraction methods will spare the local ecosystem. “The company speaks ‘half-truths’,” Georgios K. Triantafyllidis, a lecturer on mining and metallurgical engineering from the University of Thessaloniki, told IPS. The company has promised to refrain from using chemicals like cyanide or from emitting arsenic into the surrounding forests – but their “novel” practices are based on “scientific theories not yet proven in production”. Past mining activity has set a negative precedent among locals, who do not trust claims of environmental sustainability. On Apr. 3, the results of a chemical analysis of samples from an old mining site the company plans to reintegrate into its production network showed arsenic contamination that was 42,000 times higher than the allowed levels. On Apr. 17 the Constitutional Court of Greece declined the motion filed by residents against the validity of the Ministry of Environment approval of the environmental study submitted by Hellas Gold. Locals are also concerned that mining will destroy the tourism industry here, currently the region’s biggest employer and income generator. But the mineworkers and their families are determined for the project to succeed. Having spent 26 years working in mines Aggelos Deligiobas, president of the Miners Union, told IPS he and others employed in the sector “will do everything in order to save [our] jobs”, insisting that if there was a real threat of environmental damage, they too would intervene to prevent it. Disagreements have run deep into the local community, causing rifts between friends, neighbours and even families. This instability could impact attempts by the Hellenic Republic Assets Development Fund to catch the eye of foreign investors in a 50-billion-dollar sale of most of the country’s wealth, a privatisation spree that many have termed a “total carve up” of the Greek economy. Media coverage of the state’s heavy-handed repression of protests against this wave of privatisation could dissuade investors and spur support for local activists. Last September, for example, the police cracked down brutally on a group of protestors marching peacefully toward the open pit construction site. The ensuing images of elderly villagers running to escape heavily armed riot police shocked the country. In a press conference on Mar. 20, Eldorado Gold threatened to reconsider its investment if the government failed to “stabilise” the situation. The company also launched what experts here called a “charm offensive”, inviting journalists of major publications and TV channels to tour Eldorado Gold’s sites in Greece and Turkey between Apr. 7 and 10, a move the Green Ecologist Party here has denounced as a ploy to deflect criticism. On Apr. 9, a Facebook page dedicated to the company received more than 10,000 “likes”, many of them originating in Moscow, eliciting accusations from social media aficionados that the company has resorted to “buying” a good reputation. According to statistics from the research company Media Services SA, Hellas Gold has given itself a virtual makeover. Between January and March 2013, the company paid over 630,000 euros for adverts, more than the company spent for all of 2012, shelling out roughly 370,000 euros in March alone. One of the most popular advertisements uses images of the “workers” along with their names, implying that these are legitimate defenders of a plan resisted by hooded vandals. Against a 24 percent dip in the advertising market in Greece, it is clear the company is going against the trend of the business community to stabilise its position in Greece. Several requests for comments from Hellas Gold and Eldorado Gold went unanswered.